PWP joined Michael Arad in the final stage of the Memorial design competition with a mandate from the jury to humanize the scheme without diminishing the abstraction that had established it as a finalist. 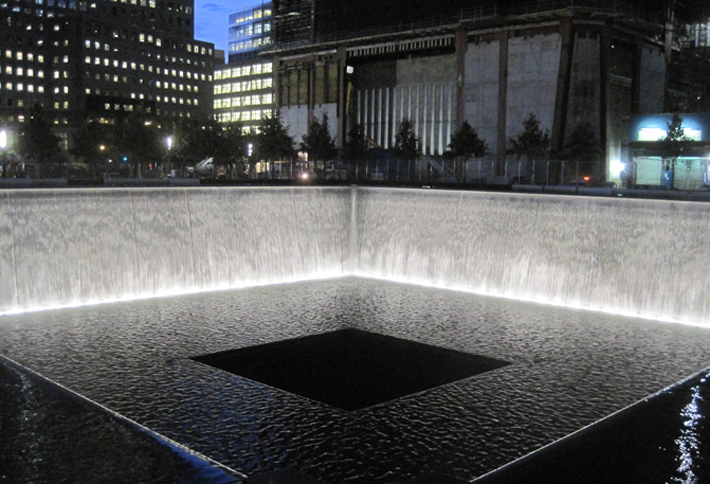 The broad scope of the trauma of 9/11 requires that the Memorial use a symbolic language understood by a diverse audience; this language is an integral part of “Reflecting Absence” by Michael Arad and Peter Walker. Visitors will leave the everyday life of the city and enter into a sacred zone defined by a dense forest of 416 oak trees. Above the limbed-up trunks, a canopy of leaves will provided welcome shade in the heat of the summer and seasonal color in the fall. In the winter the sun will cast shadows through a light tracery of bare branches, and in spring, the trees will express the renewal of nature. Using a language similar to Michael Heizer's North, East, South, West, the voids render absence visible. In this way, the overwhelming losses of September 11th are given permanent presence. Within the protected space of the forest, visitors will arrive at the two great voids with their thundering waterfalls. After viewing the victims’ names on the bronze parapets of the voids, visitors will move back to the city through the trees and take comfort from the soothing, life-affirming forest. Through the trunks of the trees the flat plane of the park is visible in its entirety. The density of the trunks extend the apparent depth and size of the plane and at the same time soften the view of the buildings beyond. 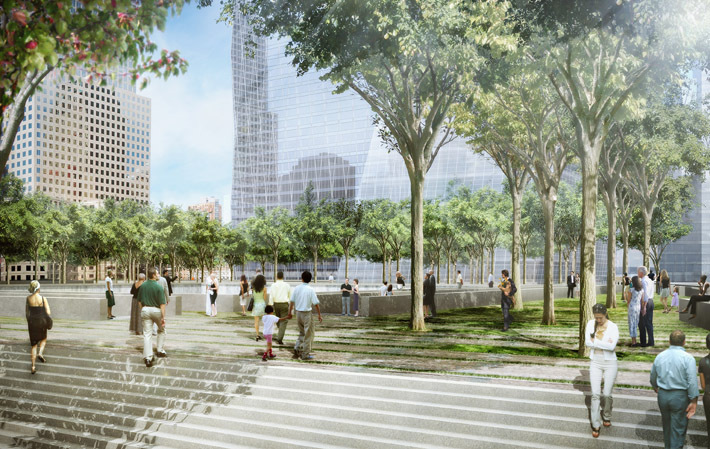 The horizontal surfaces of the plaza--stone, ground cover, lawn, and steel grating--are patterned to assert and reinforce the flatness of the constructed plane. PWP combined graphic techniques and technical solutions developed through the firm's long tradition of designing perceptually flat landscapes. 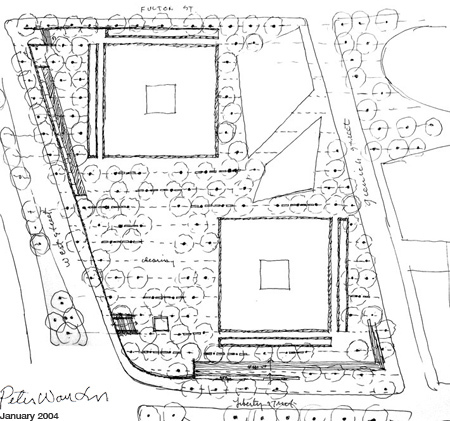 The one-acre voids, cut 30 feet into the site, are lined with waterfalls designed by Dan Euser (http://dewinc.biz), a longtime collaborator of PWP. Using full-scale mock-ups to study the performance of the water, Dan developed a tapered, rounded weir that is both water-and-energy efficient as well as highly visible and beautiful. With the addition of lighting designed by Paul Marantz, the waterfalls are also visible at night. 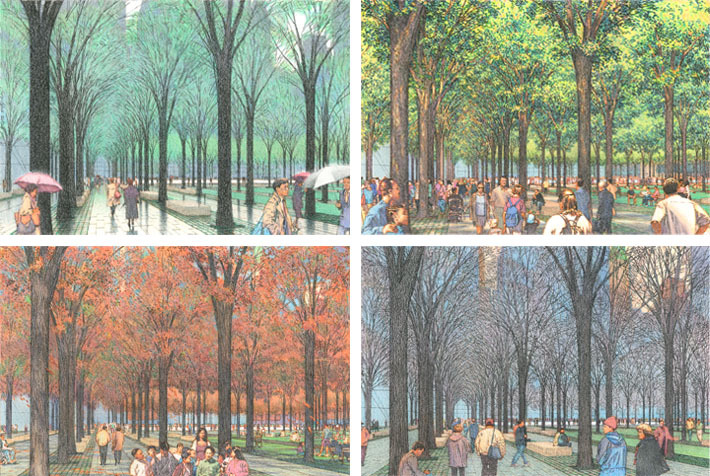 The Memorial grove will resemble a “natural” forest, until visitors discover that the trees align to form arching corridors in one orientation. The form recalls the arches that architect Minoru Yamasaki placed at the bottom of the original towers. In this way, the grove expresses the shared patterns of nature and humanity. A grassy clearing within the grove is a quiet space away from the bustle of the plaza. 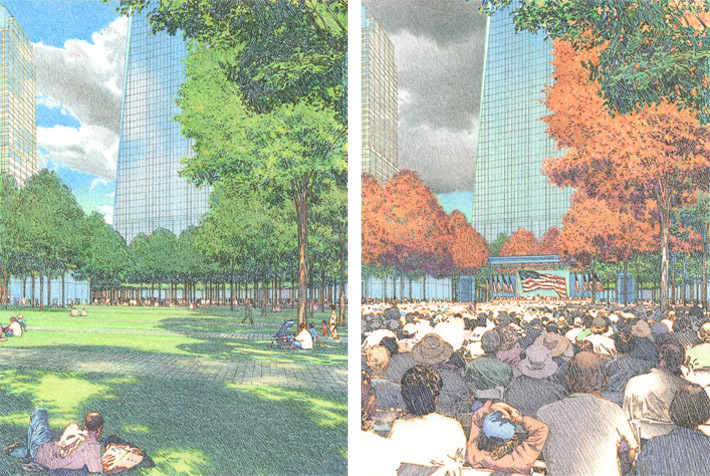 Designed to accommodate ceremonies--specifically, the reading of victims' names annually on September 11th--the space also provides soft green park space on typical days. 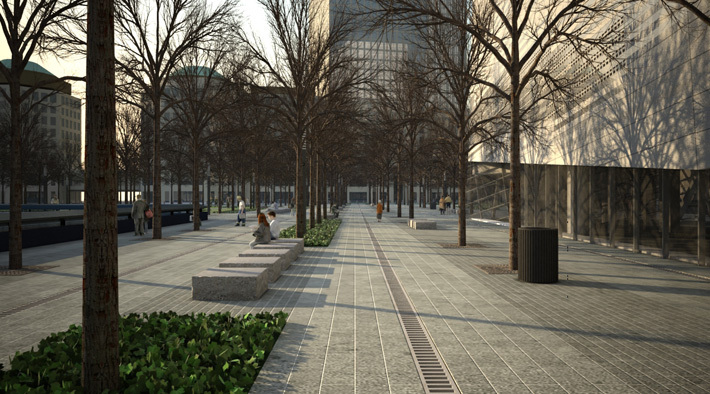 Within the Memorial grove, the varying distances between trees, the placement of benches, and the rhythm of ground-cover beds will create spaces with distinct scale, character, and qualities of light. PWP studied the paving pattern at full scale in chalk, ultimately arriving at 12” x 60” pavers and 3” x 15” cobbles. 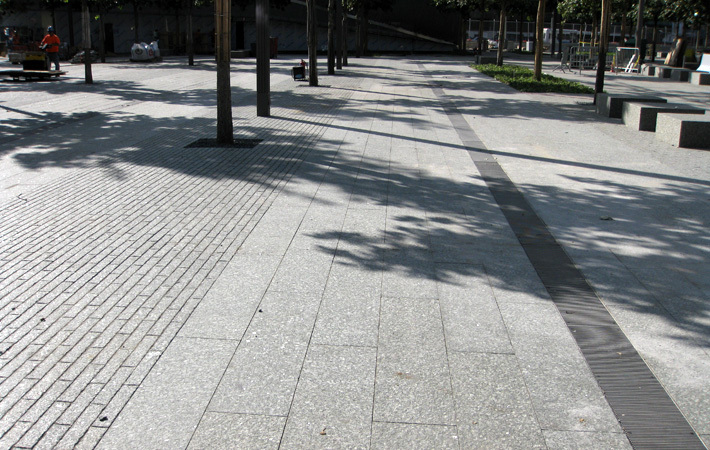 The varying density of shadows in the joints between the pavers and the cobbles creates a subtle banding pattern that breaks up the vast flat plane of the Memorial into human-scaled zones.